Before Johnny Manziel has even responded to allegations of improper benefits in Miami, there's new evidence that the Heisman Trophy winner was paid thousands of dollars to autograph sports memorabilia in Connecticut. 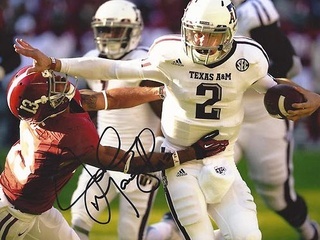 Citing a nine-minute video of Manziel signing helmets and footballs, ESPN reports that the Texas A&M sophomore quarterback was paid $7,500 for an East Coast autograph session that occurred January 11-12 as Manziel attended an event for the Walter Camp Football Foundation. The broker, who taped the star quarterback without his knowledge, told ESPN that Manziel planned to use the $7,500 to put new rims on his black Mercedes-Benz. He's previously been accused of accepting $10,000 for autographing hundreds of items while in Miami for the BCS National Championship. In the video, Manziel allegedly tells the autograph broker, "You never did a signing with me," and threatens to cut him off from future sessions if he spoke of their meeting. Manziel displays a disturbing level of savvy in his dealings with the broker, refusing to use special inscriptions as it might raise suspicions. If the allegations are true, Manziel would be in violation of NCAA bylaws that prevent athletes from accepting money for their services related to sports or advertising, whether they are on the field or off. With Manziel's high profile, many are wondering if the NCAA would look to make an example out of its brash young star with a lengthy suspension. USA Today reports that Texas A&M has hired the law firm Lightfoot, Franklin and White to handle Manziel's inevitable legal battle to play this season. Lightfoot has proven adept at navigating NCAA investigations. In 2010, the firm helped another Heisman Trophy winner — Auburn's Cam Newton — stay eligible for football season.